The Meyer Lemon: More Than A Pretty Face Plucked out of obscurity from life as a houseplant and nearly eradicated by disease, the thin-skinned Meyer lemon wouldn't go down without a fight. Now it's a darling of chefs and home cooks — slightly sweet, super juicy and not at all tart. 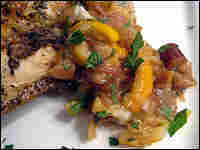 Get recipes for Meyer Lemon Compote, Roasted Root Vegetables And Meyer Lemons and Meyer Lemon Bars. Julie O'Hara is a freelance writer and recipe developer in Fort Lauderdale. She has written for National Geographic Traveler, Vegetarian Times and Self, and is a contributing editor for Shape magazine. Read her food blog, A Mingling of Tastes, or visit her Web site, julieoharawriter.com. For more than a century, the Meyer lemon was known mostly for its looks. In its native China, it was primarily a decorative houseplant. A cross between a lemon and a mandarin orange, the Meyer lemon has smooth golden skin the color of a fresh egg yolk. It also has a thin edible rind, a high volume of juice and none of the tartness of a regular lemon — yet its potential in the kitchen went unnoticed. Today, the Meyer lemon is a darling of farmers markets and beloved by chefs and home cooks. Its aromatic, slightly sweet quality brightens desserts, sauces, salads and roasts. In fact, Meyers may be substituted for regular lemons whenever you want a burst of lemon flavor without the acidic bite. Though it took a long time for the Meyer lemon to make its way into the culinary limelight, it was worth the wait. The Meyer lemon might still be decorating homes today if it weren't for one man. In the early 1900s, the U.S. Department of Agriculture sent Frank N. Meyer, an agricultural explorer (yes, that was his actual job title) on several trips to Asia with the mission of collecting new plant species. Among more than 2,500 plants that he introduced to the U.S., the Meyer lemon was named in his honor. Sadly, Meyer would never live to see the success of his namesake. He died on an expedition near Shanghai in 1918. 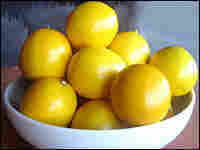 After landing on American shores, Meyer lemons were cultivated in the citrus-growing regions of California, Florida and Texas. A favorite backyard tree enjoyed by locals, Meyers never made a splashy national debut. Their thin, delicate skin and high juice content made them too fragile to distribute commercially. In the 1960s, the majority of Meyer lemon trees in California were destroyed by a virus they carried, which threatened the entire citrus industry. Fortunately, one stock was deemed free and clear of disease and became the source for a newly developed "Improved Meyer Lemon" tree. The Meyer lemon remained confined mostly to farmers markets near the citrus belt until about five years ago. Martha Stewart is the fairy godmother of this Cinderella story. According to Bobby Smith, whose family owns South Naples Citrus Grove in Naples, Fla., the popularity of Meyer lemons has soared since food and lifestyle maven Stewart began featuring them in recipes, such as her lemon-pine nut tart, whole-wheat spaghetti with arugula and pistachios, and a take on classic coffee cake with thinly sliced Meyer lemons in the batter. As it turns out, the soft, thin skin that makes Meyer lemons so difficult to ship long distances is one of their most appealing features when it comes to cooking. The layer of bitter white pith that makes a thick protective coating for regular lemons is so thin on Meyers that they may be eaten in their entirety, peel included. Cut thin slices, remove the seeds and roast them with root vegetables, chicken or fish. 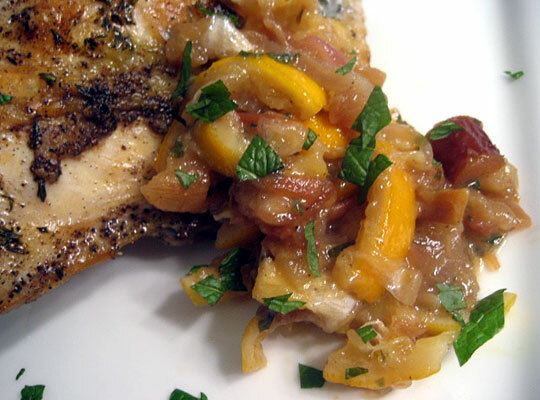 Or combine them with dried fruit and white wine for a quick savory compote. Another delicious way to enjoy the flavor of the whole fruit is in desserts. Cut a Meyer lemon into chunks, give it a rough chop in a food processor, and add to muffins or tea cakes. 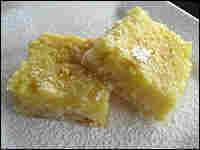 Meyer lemon bars showcase not only the sweet, aromatic juice, but also the slightly sour punch and intense lemon essence of the peel. Meyers may be used anywhere you want to add pure lemon flavor with none of the burn. Squeeze the juice over fish or add to salad dressing. Grate the zest over risotto or steamed vegetables. In sweet foods such as marmalade, lemonade or lemon bars, the lower acid level means less sugar may be required. When acidity is desirable for opening up the flavors of a soup or adding depth to a sauce, stick to regular lemons. Dreaming up ways to use Meyer lemons is less of a challenge than actually finding them if you live far from a citrus-growing region. Their season begins in November and extends into March and as late as April. 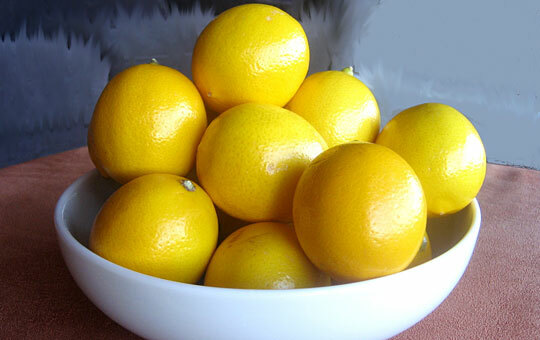 The difficulty of shipping means that many supermarkets still do not stock Meyer lemons, but specialty grocers are increasingly likely to do so. Another option is to order your own personal supply online straight from a grower. Intimidated by the thought of 10 pounds of lemons? Don't be. Instead, think of it as building up your arsenal of flavor-boosting ingredients for months to come. Grate the zest into ice cube trays, then fill with juice. Once frozen, transfer the cubes to freezer bags. Defrost as many cubes as you need for a burst of lemon flavor in baked goods, main dishes or cocktails. Whole lemons will keep in the refrigerator's crisper for about five days. Plucked out of obscurity from life as a houseplant and nearly eradicated by disease, the thin-skinned Meyer lemon wouldn't go down without a fight. Talk about turning lemons into lemonade. Serve this quick fruit condiment with roasted chicken, pork or fish, or spread it on a sandwich. It would also be delicious as a topping for flatbread or toasted baguette slices with crumbled goat cheese. Any medium-dry white wine will work, but my favorite is one with floral or fruity flavors, such as Riesling, viognier or chenin blanc. Trim the ends of the lemons so you can see the flesh and no white pith. Cut into 1/8-inch rounds, picking out seeds as you go. Halve or quarter the rounds so they're all about 1/2-inch pieces. Set aside. Heat the oil in a skillet over medium-low heat. Add shallots and cook until very soft, 6 to 8 minutes. Add wine and simmer until reduced by about one-third. Add lemons, sugar and dates, and simmer until wine is almost completely reduced. Remove from heat, season with salt and pepper to taste and stir in all but 1 tablespoon of the mint. Garnish with remaining mint just before serving. This recipe is versatile. 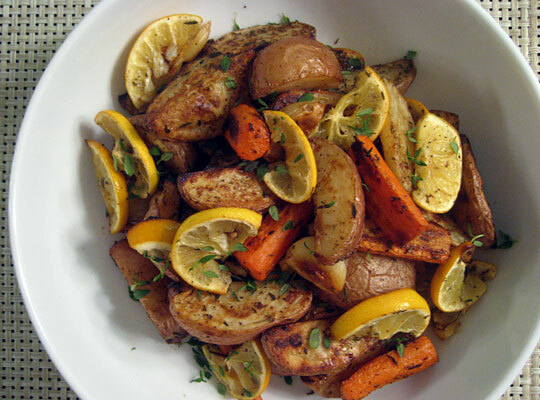 Try other types of potatoes; add whole shallots or wedges of red onion, or substitute parsnips for the carrots. Preheat oven to 450 degrees. Coat a rimmed baking sheet with cooking spray. Add potatoes, carrots, garlic cloves, thyme and salt and pepper to taste. Drizzle with oil and toss well. Roast 15 minutes. Meanwhile, trim the ends of the lemons so you can see the flesh and no white pith. Cut into thin slices, removing the seeds. Cut slices into half-circles. After 15 minutes is up, remove baking sheet from the oven and toss the lemons with the vegetable mixture. 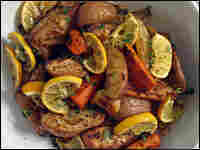 Return to oven and roast until vegetables are tender, about 15 minutes more. Sprinkle with fresh thyme, if using, and serve. 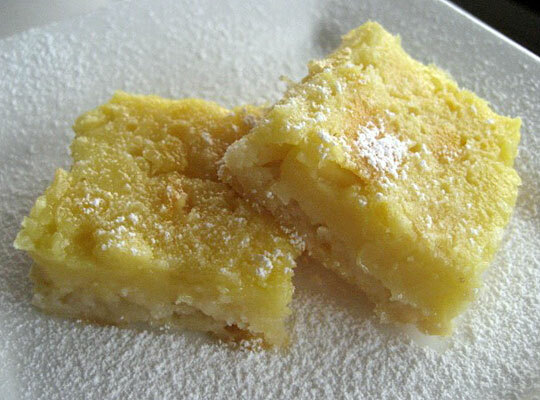 A chopped whole Meyer lemon adds texture and a big flavor punch to traditional lemon bars. Preheat oven to 350 degrees. Coat an 8-by-8-inch baking dish with cooking spray. In a food processor, pulse flour, powdered sugar, salt and zest until combined. Add the butter and pulse until mixture resembles sandy crumbs. Transfer to baking dish and press into an even layer with your fingertips. Bake for 15 to 17 minutes, or until lightly golden around the edges. To make the filling, wipe out food processor bowl. Trim off ends and cut the whole Meyer lemon into small chunks, removing the seeds. Add to processor and pulse until roughly chopped. Set aside. Whisk together the sugar, flour and salt. In a separate bowl, lightly beat the eggs, then whisk in the lemon juice. Whisk the egg mixture into the sugar mixture until thoroughly combined. Stir in the chopped whole lemon. Pour filling over the hot crust and return to oven. Bake 28 to 30 minutes, or until center is set but still gooey when poked with a toothpick. Cool completely. Sift powdered sugar (if using) over the dish. Cut into 12 or 16 bars and serve. Best eaten within 24 hours. Cover and store at room temperature.